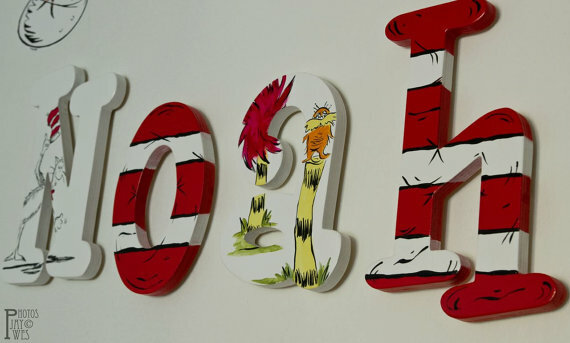 Hand Painted Nursery Letters Inspired by Classic Dr. Seuss Characters. Or the adorable Pottery Barn Kids Cat in the Hat Bedding Collection. Letters will also feature The Cat's Hat Stripes on every other letter. *If you want only characters you must purchase the letters from that listing they are $2 more per letter. Sizes available: 7", 8", 10", 12", 14" prices listed below just click drop box. To order put in the amount of letters needed (Emma=4 letters) And fill out the order form, your order will not begin until this form is received (see link below) You will need to complete payment from the website, the order form does not link you to make payment.